The nice weather has us out on the bike together at least once a week, if not more. 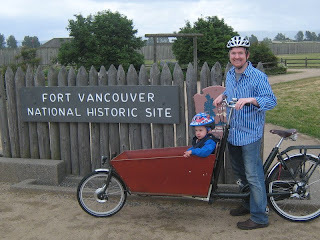 Last weekend Everett and I took a ride to Fort Vancouver to see some reenactments of life in the 1800s. There were sprinkles throughout our visit, but now I've learned to keep a shower cap tucked under the seat in order to keep it covered when I'm not riding. No more soggy saddles! We, of course, were completely unprepared ourselves and got a bit of a soaking. This Sunday morning we joined with some of our neighbors for a small group ride down to Esther Short Park for the Recycled Arts Festival and the Farmers Market. It was great riding with friends -- I'd forgotten about the social aspect of cycling. Everett is great company, but his conversations leave a bit to be desired. Bike parking was available at the park, and was much appreciated. I hope that at some point this weekend it was more full than in this photo. At the cycling booth, I grabbed a few of the Vancouver cycling maps, since all of my copies tend to disappear when friends see them. At least one is going to stick around this time. One recent, unfortunate development is that Everett has gotten very anxious about being pinched by his helmet straps, and twists and turns his head or buries his chin into his chest as I try to fasten it on. Of course, this makes it even more likely he will get pinched. He hasn't been pinched recently, so I'm not sure where the fear came from all of a sudden. Does anyone have tips on how to deal with this? He's 22 months old now, if that affects the approach I should take. 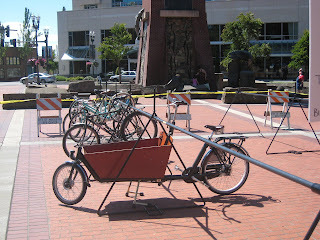 I created this blog to share my experiences with the Bakfiets cargo bike. Expect trivially personal anecdotes, ride reports, and whatever else Bakfiets-related that I find interesting.